SpaceX CEO and uncharismatic Tony Stark action figure Elon Musk continues to kick his plans for a space-faring civilization down the information-overloaded corridors of public opinion, recently calling for a human outpost on the Moon. “To really get the public real fired up, I think we’ve got to have a base on the moon,” Musk told attendees of the 2017 International Space Station Research and Development (ISSR&D) conference held in Washington, D.C last week. “Having some permanent presence on another heavenly body, which would be the kind of moon base, and then getting people to Mars and beyond — that’s the continuance of the dream of Apollo that I think people are really looking for,” the gazillionaire entrepreneur told NASA Space Station program manager Kirk Shireman, who interviewed him onstage at the conference. Faster than a speeding bullet, Elon Musk’s Hyperloop system would zip passengers on a cushion of air via subterranean vacuum-sealed tunnels. 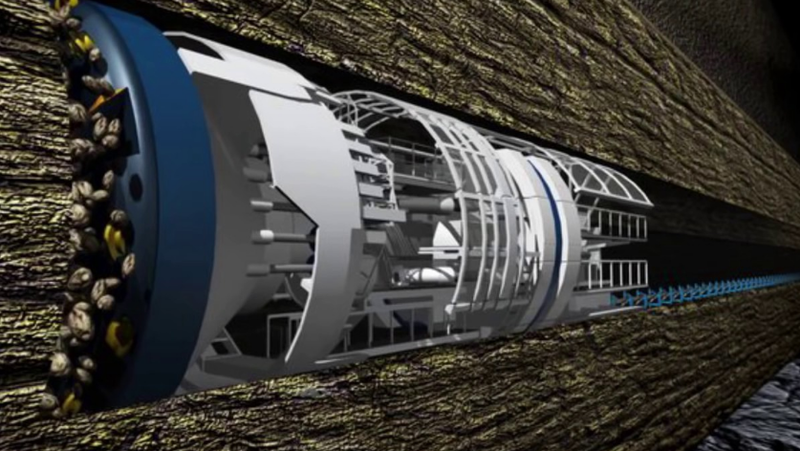 Musk earlier this month claimed that The Boring Company had received verbal government approval to build an underground, supersonic hyperloop transportation system connecting New York City, Philadelphia, Baltimore, and Washington, D.C. The New York to Washington, D.C. hyperloop, which Musk boasts will take 29 minutes to travel from city center to city center, will be built in parallel with the Los Angeles tunnel system announced in May. 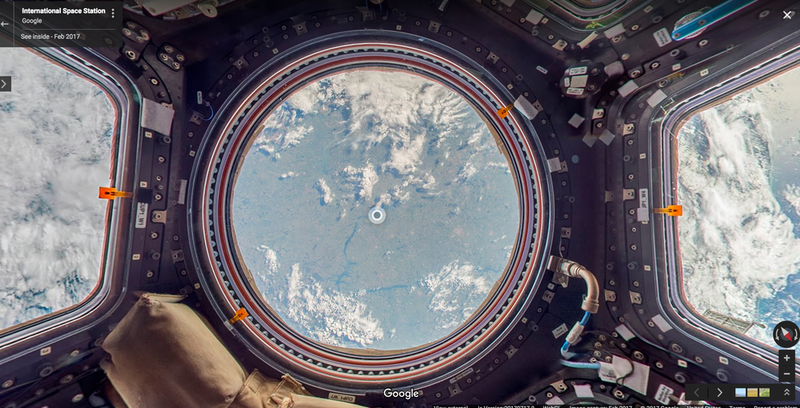 Last week, Google maps officially linked Earth and the cosmos, publishing “Street View” images of the International Space Station. Taken by ESA astronaut Thomas Pesquet during his just-completed six-month stint aboard the ISS, the annotated photos were produced using DSLR cameras and other equipment already on the orbiting laboratory and then beamed down to Earth where they were “stitched together to create panoramic 360 degree imagery of the ISS,” said Pesquet. “The mission was the first time Street View imagery was captured beyond planet Earth … [and] provide additional information or fun facts like where we work out to stay physically fit, what kind of food we eat, and where we conduct scientific experiments,” Pesquet added in a Google blog posted last Thursday. NASA’s eagle-eyed Hubble Space Telescope continues to amaze with a short string of photographs released by the space agency showing Mars’ tiny moon Phobos zipping around the Red Planet. Apparently the football-shaped satellite photobombed Hubble’s portrait of Mars as it recently snapped a series of 13 separate pix over a 22-minute time period. The tiny, pockmarked Phobos, which measures just 16.5 miles by 13.5 miles by 11 miles making it one of the smallest moons in the solar system, appears as a small star in a short video NASA released last week produced from the multiple Hubble images. In a follow-up to last week’s “Grab Bag” item, the auctioned satchel used by astronaut Neil Armstrong to bring back the first lunar dust samples to Earth was sold to an anonymous winning bidder who snatched the historic item for the gavel price of $1.8 million — less than the anticipated $2-4 million reported last week. 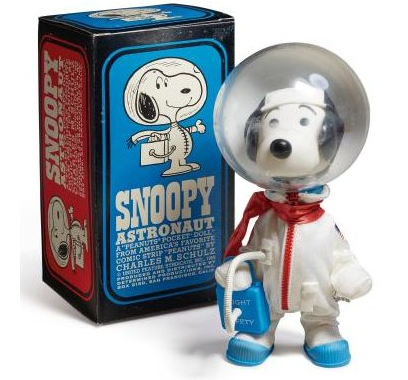 According to USA Today, Sotheby’s was still beaming about its space memorabilia sale marking the 48th anniversary of the first moonwalking mission, as it raked in $3.8 million from other items that sold way above their appraised values including the Apollo 13 Flight Plan that fetched $275,000, a $17,500 pic of man’s first look at the Earth from the Moon, and a Snoopy astronaut doll that went for a galactically-inflated price of $27,500. 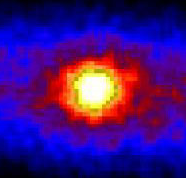 Image of the Sun taken through the Earth in “neutrino light.” The most abundant substance in the universe, neutrinos interact so weakly that trillions pass through each of us every second. Bigwigs from science and politics congregated deep underground at an abandoned gold mine in South Dakota last week for a stone-turning ceremony at the planned site of a gargantuan particle detector that will serve as part of the next grand physics experiment designed to determine the nature of the spooky, elusive neutrino. “We couldn’t be more excited to be actually starting construction,” says Mike Headley, head of the South Dakota Science and Technology Authority in Lead, adding, We’re absolutely thrilled that [the project] is moving forward and about what it’s going to do for the U.S. scientifically,” Known as the Long-Baseline Neutrino Facility (LBNF), the $1.5 billion project will fire neutrinos from Fermi National Accelerator Laboratory (Fermilab) in Batavia, Illinois, to a the Lead detector 1300 kilometers away, and will help determine how different neutrino types morph into one another as well determine how slight asymmetries between neutrinos and antineutrinos caused the infant universe to form. A team of researchers at the University of California, Santa Barbara, are giving a new meaning to the phrase “creepy crawler,” with a newly-created robot that expands exponentially as it slithers with the determination of a Terminator T1000 to accomplish its programmed mission. 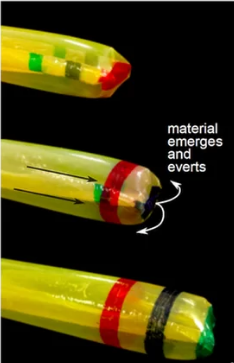 A recently-published article in Science Robotics introduces the grow worm concept that was conceived by the group lead by Elliot Hawkes, a roboticist at UCSB who was inspired by watching his English ivy plant grow around a corner seeking sunlight. 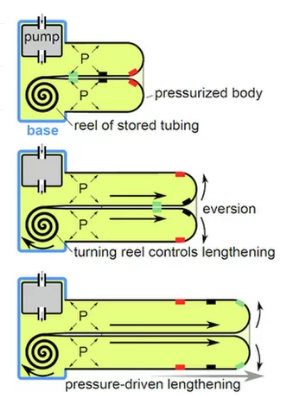 Up until now most robot designers have used locomotion similar to humans or animals to move their machines; however the UCSB team’s “growbot” expands by using eversion powered by either pneumatic or hydraulic pressure basically turning inside out as the material coiled in it emits from its tip. The scientists believe self-propagation has advantages over typical locomotion such as the ability to maneuver in constrained spaces, widen, and become 3D. Until now, rudimentary cyborgs’ ability to extend had been constrained to only about 5 times their body length and it was done very slowly (centimeters per hour). Depending on the dimension of the coil and power of the pressure this new contraption can grow very quickly from inches to hundreds of feet at 22 miles per hour! 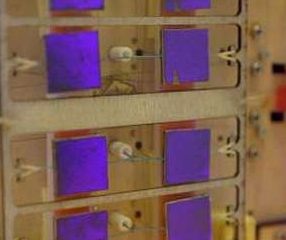 Tests have shown that it can withstand surfaces covered with nails and glue, squeeze through small crevices, move around awkward angles, lift heavy weights, and still keep going. Cameras installed on the tip allow the operator to see what is happening, and maneuver it. It has been tested on several tasks so far, including pulling cable, spraying water on a fire, lifting a heavy crate, and generally going places that would be dangerous or un-accessible to humans. All sorts of practical applications from search and rescue emergency response, medical procedures to the more mundane construction and packing tasks, to more out-of-this world uses (see “Getting a Grip” below on a similar idea) could be made possible/easier by this type of device. For now it is constructed of easily procured, lightweight plastic but more robust materials are also being tested. 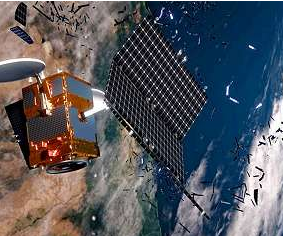 Engineers at Stanford University are working on a robotic “gripper” that would be used to help mop up the approximately 500,000 pieces of space junk orbiting our planet at potentially destructive speeds of up to 17,500 miles per hour, reports Space Daily. Abandoning traditional terrestrial adhering materials that fail in extreme space environments as well as more invasive tactics that could ricochet debris into more dangerous trajectories, researchers are testing “gecko-inspired adhesives” as an “outgrowth of work we started about 10 years ago on climbing robots that used adhesives inspired by how geckos stick to walls,” says Mark Cutkosky, professor of mechanical engineering and senior author of a study published in the June 27 issue of Science Robotics. The team has already performed tests aboard the International Space Station, and look to see how their concept works outside the craft. “We could also eventually develop a climbing robot assistant that could crawl around on the spacecraft, doing repairs, filming and checking for defects,” adds Aaron Parness of NASA JPL. Russian designed Mayak satellite would use metallic reflectors to remove space junk circling the Earth. In related news, Space Daily also reports that students at the Moscow State University of Mechanical Engineering are cheering the launch earlier this month of a satellite they designed that will test aero-braking techniques used in removing space junk from Earth’s orbit. 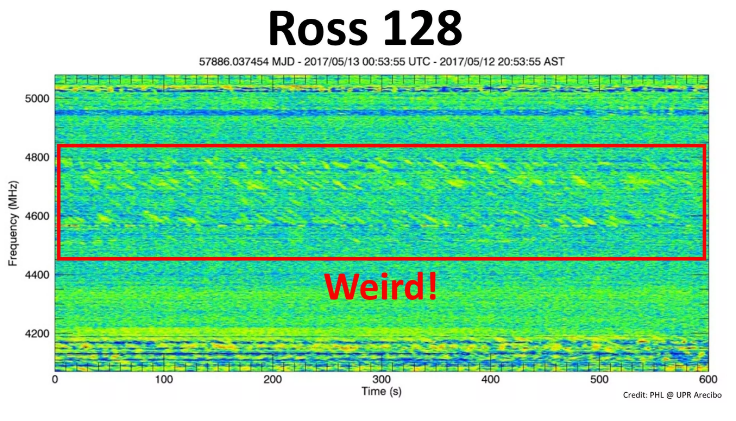 The red dwarf star in the nearby Ross system known as Ross 128 has been used as the setting for a few science fiction novels and even a video game from the 90’s, so when it was reported recently that there were some very odd and inexplicable radio signals coming from it, ET hunters went into speculative high gear. Alas for those persistent zealots, the truth, it seems, is probably much less fantastic and possibly downright snooze worthy. Abel Mendez, a professor at the University of Puerto Rico at Arecibo’s Planetary Habitability Laboratory, suggested in a blog post this week they could be caused by: 1) solar flares from Ross 128; 2) emissions from another object in the field of view; or just 3) bursts from a high orbit satellite (sigh). But while these are good working interpretations, they are not watertight, so our faithful scientists will be looking and listening again to try to clarify which it is – or not. 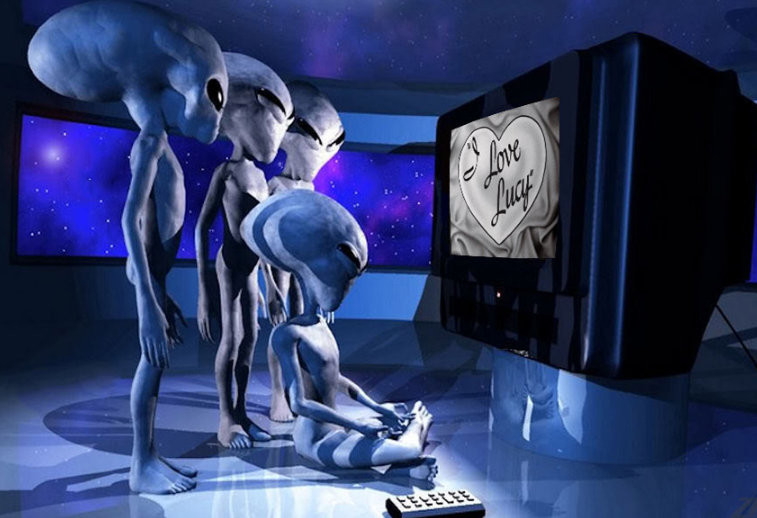 True believers can take heart in Mendez’s sign off that “In case you are wondering, the recurrent aliens hypothesis is at the bottom of many other better explanations.” Mendez jokes that he “has a pina colada ready to celebrate if the signals result to be astronomical in nature.” Amen to that! This entry was posted in The Weekly Revolution and tagged Google Maps, hyperloop, Mars Exploration, Moon exploration, neutrino, particle accellerator, robotics, SETI, space based astronomy, space junk, space memorabilia, Space station, tunneling by bonwitt. Bookmark the permalink.